Data Map Shows Computer Science, Business are the Most Popular Online Courses in the U.S.
Coursera has analyzed data from 5 million students in the United States who have enrolled in the company’s massive open online courses (MOOCs), uncovering that computer science and business are the most popular topics overall in the majority of states. Specifically, California and Washington were found to be the top two states in every subtopic within computer science. The former is ranked No. 1 and the latter is No. 2 for the following course topics: algorithms; computer security; design and product; machine learning; math and logic; mobile and web development; and software development. Notably, Alaska ranked No. 1 in engineering and physical science courses. Not too surprisingly, Washington, D.C. has the most students enrolled in government-related topics (i.e., society, economics, law), followed by neighboring states Virginia and Maryland. 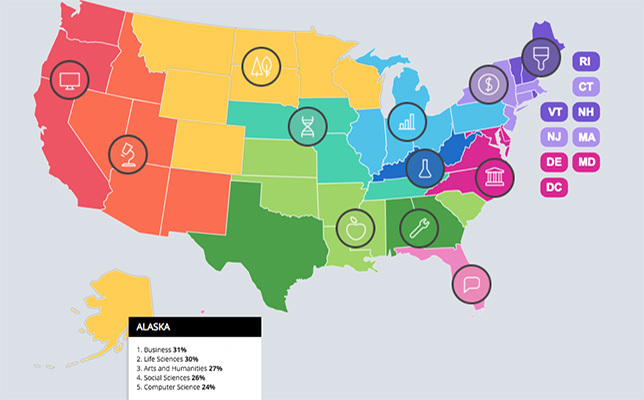 Mississippi has the highest relative interested in education, with an emphasis on school subjects like history and chemistry, according to the blog post. Hot Pink is “Federal Way,” an area found near the nation’s capital that has the most government courses being taken. The map allows users to delve deeper into the data and see rankings for each individual state. To learn more, view the “United States of Knowledge,” available here.